The cab-hailing service is looking to welcome its next million users from emerging markets with a stripped down version of its original app which now weighs in at just 5 MB and is designed to work with slower than average internet connectivity and compatibility with any Android device. 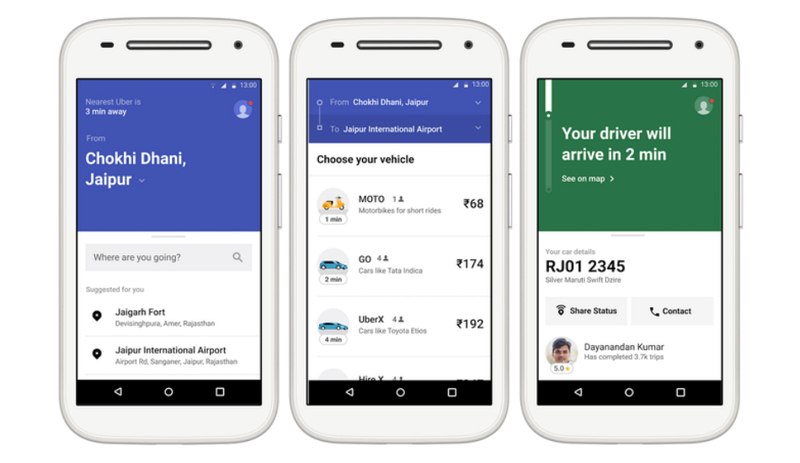 Uber is launching its Uber Lite app in India as part of its global release which is set to happen in its other emerging markets in the coming weeks. The app which weighs in at just 5 MB comes with almost all the features by removing some key design elements to cut down on space constraints so that users with even an entry-level smartphone and slow internet will be able to use the cab-hailing app in the country. Released as a rival to Ola Lite which is the lighter version of the original Ola app, the Uber Lite will be lesser than 5MB when downloaded in contrast to the 181MB storage that its original app occupies. In order to make the app usable in slower than average internet speeds, the Uber Lite will make do without the inbuilt map which shows your Uber ride as a tiny car on your screen. Instead, the app uses a stripped down interface which lets you enter your address and destination for quicker access. While Maps can still be added to the Uber Lite, the company suggests opting out of it will enable the app to run smoother on a budget Android phone. The streamlined design will not only let customers on 2G hail a cab but also includes original features like the ability to share trips with friends & family, language selection and further in-app support. Users will be able to select to up to 7 regional languages with more to follow as the app gets updated. Uber has clarified that even text entry inside the home screen will be faster as the Uber Lite uses the rider’s GPS information to precisely guess the location. Additionally, the app cache saves a city’s top locations on the phone so that these can be clicked upon even on the absence of a network. This will possibly gel well with a forthcoming feature that will allow riders to book a cab even without a network connectivity. Uber Lite is piloting in India and is currently available in three Indian cities - Delhi, Hyderabad and Jaipur. The app will only be seeded to Android users since Uber acknowledges that a significant amount of their users use an Android-powered device. The Lite app isn’t readily available in the Play Store but users can apply to get into the waitlist.